Very occasionally (and usually when my mind has been subconsciously primed by reading a historical novel or watching a period drama) some heady mixture of sight and smell and sound will trigger an overwhelming sense that I have been lifted out of 2015 and dumped unceremoniously two or three hundred years back in time. It might happen at Lewes bonfire on November 5th when the town consciously recreates Bloody Mary’s England and the air is thick not just with the acrid smoke of thousands of flaming torches but with the whiff of anarchy and the sense of a people – ordinarily inhibited by convention – holding their annual ‘rough music’ and reclaiming the streets. Or I might be strolling down a London street off Piccadilly, enjoying the cranes soar over a busy building site, watching the men in hard hats and luminous jackets laughing and shouting over the relentless drone of a digger, and without any warning or effort on my part I am in Georgian London. 18th century workmen are slapping wet stucco on the walls of boomtown London’s smart new homes. There’s a high perch phaeton bowling down the street, and I all but find myself lifting the hem of an imaginary dress to avoid the dung that is strewn over the cobbled street in front of me. But nowhere do I experience this disconcerting spin back in time more clearly than at the Dolphin Fair, held each September in an empty field in Ardingly. 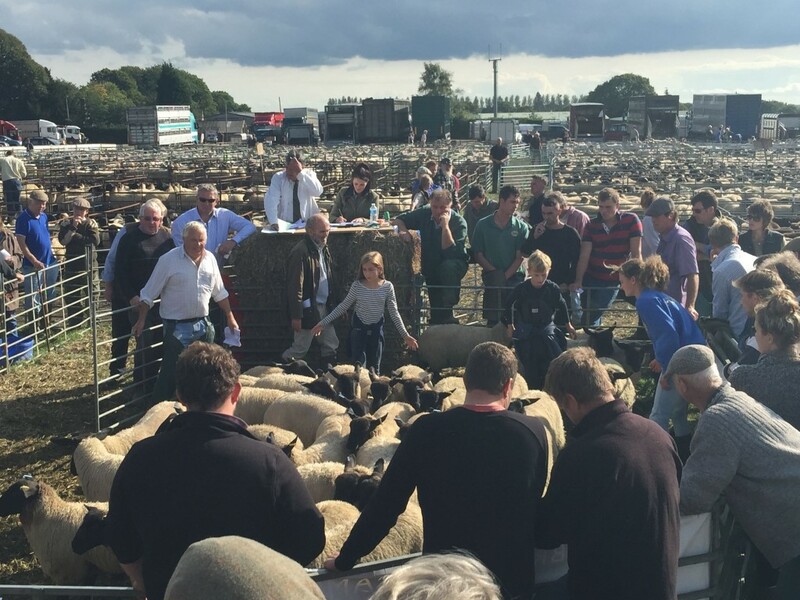 Farmers from all over the southeast come to buy and sell just one thing – sheep. Sheep as far as the eye can see, penned in with hurdles, wait uneasily for their turn in the ring and the fate of the auctioneer’s gavel. For us on the farm, the day has started early. In the 1950s and 60s, Stephen’s father thought nothing of driving hundreds of sheep on foot along the A27 from Polegate to Lewes, a full days trek just to get to market. But we load our lambs in vast double decker trailers for the 40-minute drive to the fair. They have to be sorted and loaded into precise batches of just the right number and gender for the different compartments of the lorry. It’s a day off school for Ted, Edward and Cal just as they would have had a hundred years ago when children routinely disappeared from school at the critical points of the farming calendar – harvesting and haymaking. It’s a 4.30am start – so this is no holiday. We have eight hundred of this year’s lambs and 200 of last year’s to load, and the lorries – booked to arrive at specific times – won’t hang around waiting. The more people to load and drive and shoosh the sheep up the ramps the better. Stephen stands in the ring as each pen of our sheep is sold – an early form of ‘branding’. The children drive the sheep from their holding pens down the long hurdle corridors to the ring. Once inside they move the lambs around the big pen so that the buyers can inspect the sheep from all angles. And when the sheep are sold, the gate is opened and the children herd them back to their original pen. All afternoon, the three of them work this long circuit; when our lambs have been sold they herd everyone else’s, getting dirtier and dirtier, mud and worse on their cheeks and jeans. In five hours they morph from modern kids with chronic mobile phone habits to muddy urchins who need hosing down. I half expect some betweeded squire to fling them a copper to watch them scrabble in the mud for this generous largesse. Fittingly, there’s no 3G and precious little phone reception – this eighteenth century atmosphere would surely bring any network to its knees. All afternoon, I sit on the stacked straw bale seats that look down on the ring, and I watch the ‘luck’ money change hands as grateful sellers sidle over and slip paper goodwill to their sheep’s new owners. And then suddenly the auctioneer is gathering up his papers and I look up. The sun is sinking in the sky. Most of the sheep have been loaded up, the hurdles are being dismantled, and the lorries are trundling down the track and out of sight, back into the 21st century. Tomorrow there’ll be no trace of any of us.